What pleases us? well we are, of course, all different. Thank goodness for that or the world would be terribly boring! For me personally my home is fairly seasonal. In the Winter there are open fires and throws and cushions, with magazines and books on the coffee table to burrow down with. In the Summer time, when our English weather allows, it is about eating outside and more making the garden table and chairs the place we mostly eat and rest. So then for me I change things around and put different colour patchwork quilts on the beds and change the pictures on the walls with the seasons. I love to have different samplers and pictures at any season and it is great fun designing and stitching them as well, hunting down the right fabrics and buttons and of course deciding what to make. Pictures are a personal thing to everyone, unless you know the person very well it is hard to choose one for someone. When making them to sell, this runs through my mind and I like to make some choices. My favourite thing though is a commission as you have your instructions...... You have talked through colours, likes and dislikes, where this may hang, is it to be a scene or an animal or a sampler. If you are going to make for yourself, you still have to ask these questions because you have to get it right so that you love looking at your creation. 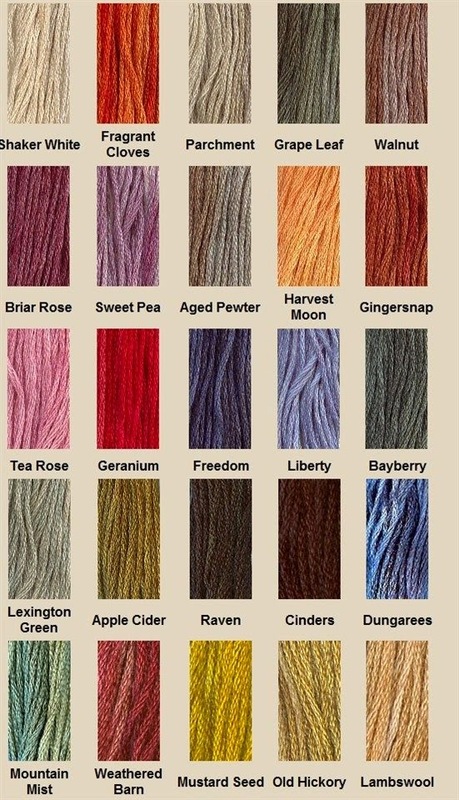 This is the some of the shaker threads I use in my work, do not forget to Join this blog to be in for a chance of winning some of these lovely's!